This is why segmentation is so important to your lead nurturing campaigns. At Marketo, we use 9 different types of variables to segment our database in order to resonate with our audience. These 9 types are just the beginning. Each segmentation has several sub-segments underneath it. Let’s say you have been segmented by our Business Unit variable. 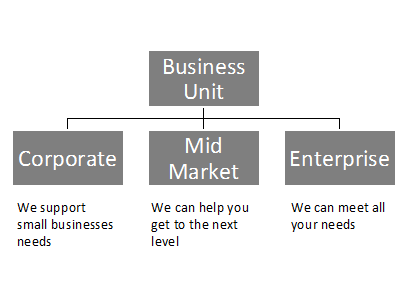 We would classify you as either a Small Business (0-300 people), Mid-Market (301-1,500), or Enterprise (1,500+). Segments, however are not mutually exclusive. Maybe you’re the social media manager of a mid-market company, or maybe you run the entire marketing team for a social media organization. In either of these cases, you would qualify for a Business Unit segment, and for one of our Topic of Interest segments – specifically, our Social Marketing track. So how do we decide which segment a person falls under? 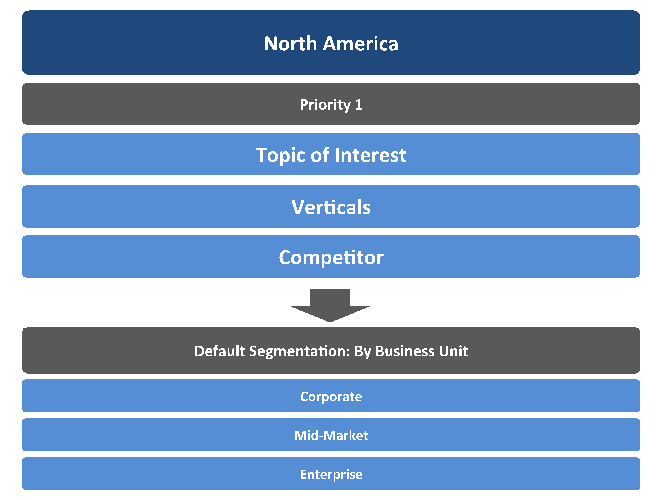 In North America, our Priority 1 segmentations are Topic of Interest (like Social Marketing, Email Marketing and Marketing Automation), Verticals (like Healthcare or Education), and Competitor (people who use one of our competitors’ marketing automation products or email service providers). 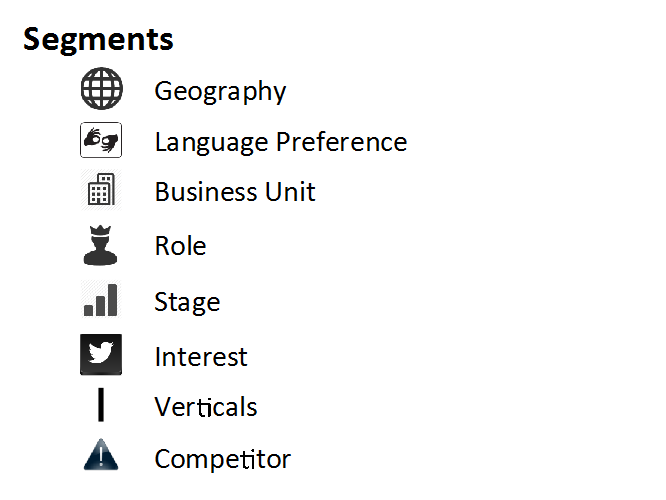 If a person doesn’t qualify for one of our Priority 1 segmentations, either because we don’t have enough information, or because none are applicable, we use our default segmentation, which is by Business Unit. If a person can be placed in one of the Priority 1 segments, that person will be put into a specific engagement program, which will send them relevant pieces of nurture content. For example, if a person attends a social marketing webinar, they fit into our Topic of Interest segment, under the Social Marketing track. We might send them materials like our Definitive Guide to Social Marketing or our eBook on Facebook editorial calendars. If someone is currently using an email service provider, they qualify to be placed in our Competitor engagement program. If someone qualifies for more than one Priority 1 segmentation, they’re placed in the program that we have defined as the higher priority. If, however, a person doesn’t meet any of the requirements of our Priority 1 segmentations, they will be placed in one of our default segmentations. 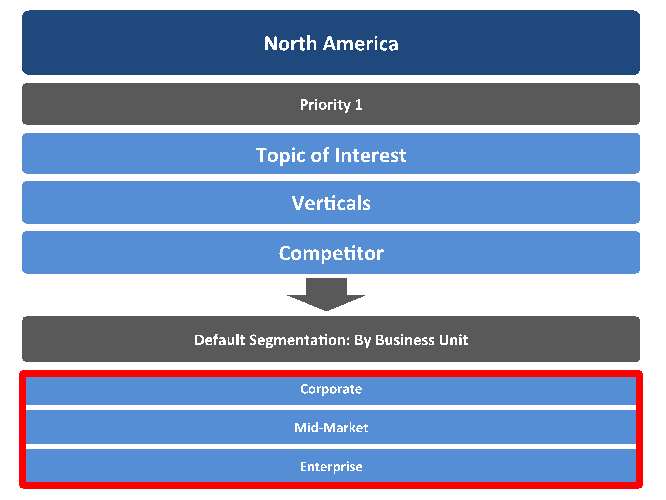 In North America, our default segmentations are by business unit, so this person would be placed in one of our three Business Unit engagement programs. But why do we need Priority 1 and default segmentations? The more focused you are in your segmentation, the more relevant your content will be, and the more engaged your audience will be. We recently found that 23% of email engagement is dependent on the level of segmentation you use. Our Priority 1 segmentations are highly specific segments that we nurture with very unique messages, and those messages wouldn’t work with other audiences. You wouldn’t send someone who is interested in social marketing a content piece about healthcare. Our default segmentations, on the other hand, are more general. There are many types of small businesses, and many types of enterprises. Still, a default segmentation allows you to have a catchall nurturing program so that no matter what, everyone receives some sort of nurturing content. We apply the same concept to our European counterparts (EMEA), but they have a different set of Priority 1 and default segmentations because their market operates differently from ours. Or it could just plainly be because Europeans are so different than Americans (I hear they drive on the other side of the road – mind blowing). In Europe, our Priority 1 segmentations are based on language preference because our European counterparts launch in different markets that speak different languages. 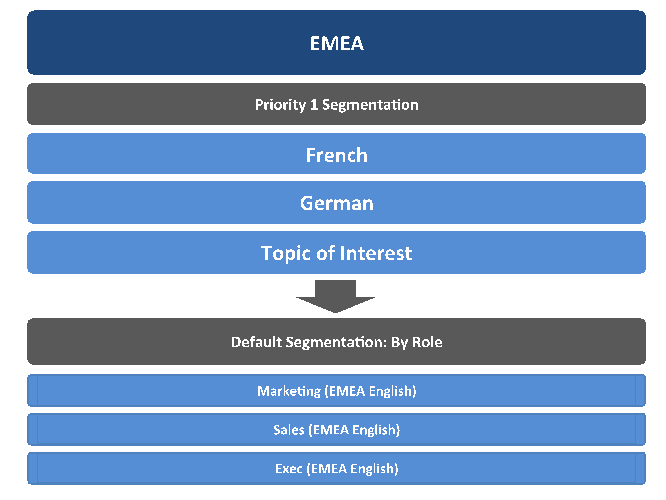 Their default segmentation is by role, because our EMEA marketers determined that roles were more relevant than business units in their market. As you can see, your Priority 1 and default segmentations can and should respond to the audiences you are speaking to. Some messages will be more relevant than others, so it’s important to prioritize based on which variables you think will be most relevant. You’ll need messaging guidelines that contain positioning statements customized to each market. These guidelines should also include a few key bullet points addressing the pain points of that specific segment. 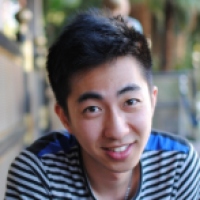 How does your product solve their specific problems? What segments do you use to identify your audiences? 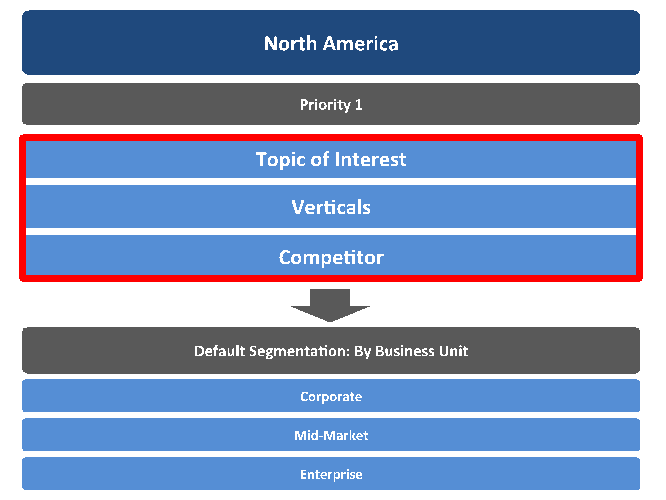 If you use multiple segmentation variables, how do you think about segment prioritization?